Bonjour! This weekend was a big one for my husband and me: we celebrated our five year wedding anniversary! Our wedding and its subsequent honeymoons (plural intended) hold some of our most precious memories. We had a really wonderful time celebrating that time in our lives as well as honoring the loss of our incredible wedding venue. 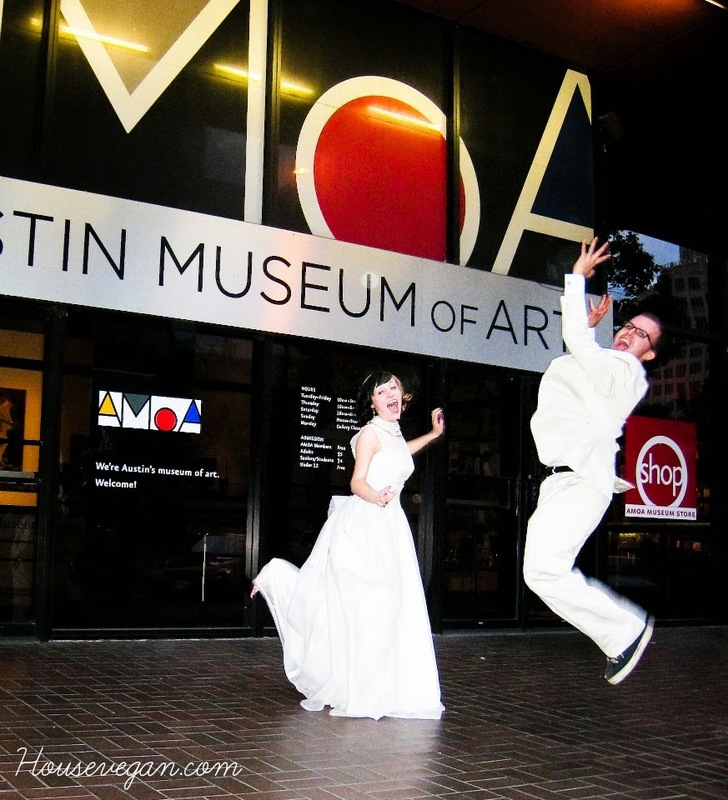 When we got married it was a gorgeous art museum in downtown Austin. Now it's home to a 7-11. A moment please. Ok, let's not dwell. The wedding was amazing and our French honeymoon was beyond words. We were lucky enough to be able to rent an apartment in Paris, and this made for the best experience for food. We ate out a few times, but mostly we cooked for ourselves and packed lunches and snacks for our adventures. It was ideal! Honeymoon Pasta was born in that teeny tiny kitchen. The fridge was under the burners! Every morning we'd eat a little baguette for breakfast before heading down to Cafe du Marché for more baguette and espresso. After our time in the cafe we'd do some site seeing. 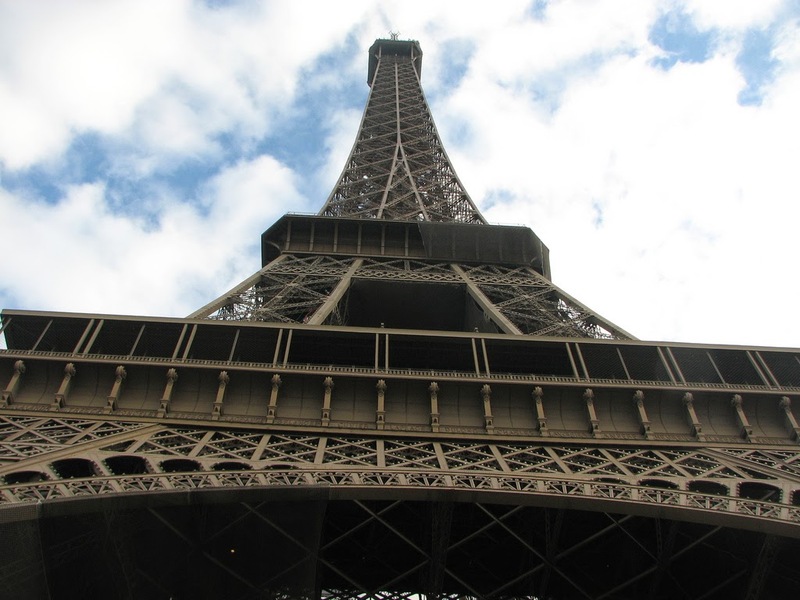 Our apartment was two blocks from the Eiffel Tower so obviously that was the first thing we saw! 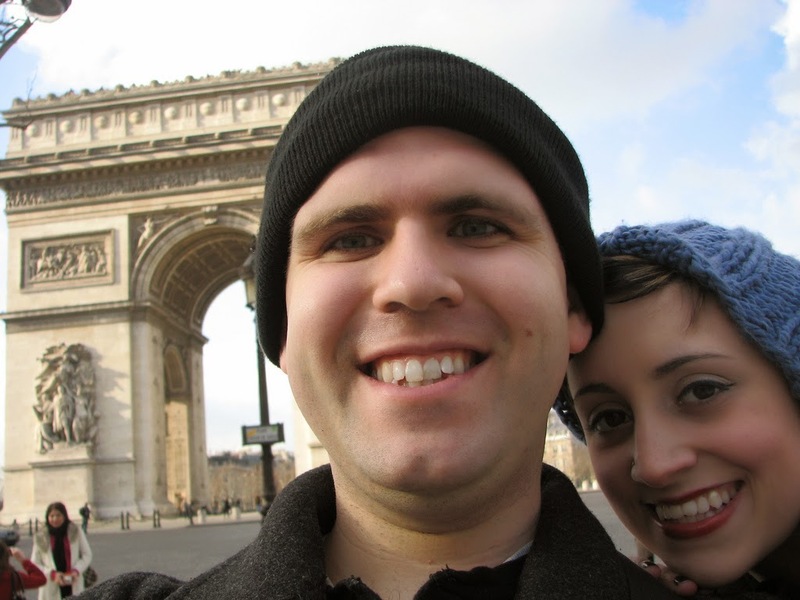 Soon after, we made our way to the Arc de Triomphe. Breathless is one of my favorite movies and greatest influences, so walking down the Champs-Élysées was a treat! After some sight seeing we'd peruse the food markets. From the Rue Cler street market, Saxe-Breteuil Market, and shops like La Grande Épicerie we'd buy lots of fruits, veggies and various other staples to cook our own meals. I'm so glad we did this! We loved exploring what France had to offer, and the food we cooked up in Paris is still a point of conversation between the two of us. Honeymoon Pasta always a part of that discussion! This is a once in a while dish for us since it carries such romantic memories. We want it to remain special! However, it's super easy and could be made often. Especially in Summer when tomatoes and zucchini are in season! 1. Preheat a small skillet over medium low heat. Add the garlic, mushrooms and 2 tablespoons of olive oil to the skillet. Low heat is essential because you don't want the garlic to burn! It will get a little golden, but that is as much color as you want. Cook, stirring often, until the mushrooms have cooked down and their water is cooked off. Season with salt to taste, and remove the relish from the heat. Cover and set aside. 2. Meanwhile, cook your gnocchi according to the package or recipe's instructions and set aside. 3. Add the remaining olive oil to a big preheated skillet over medium heat. 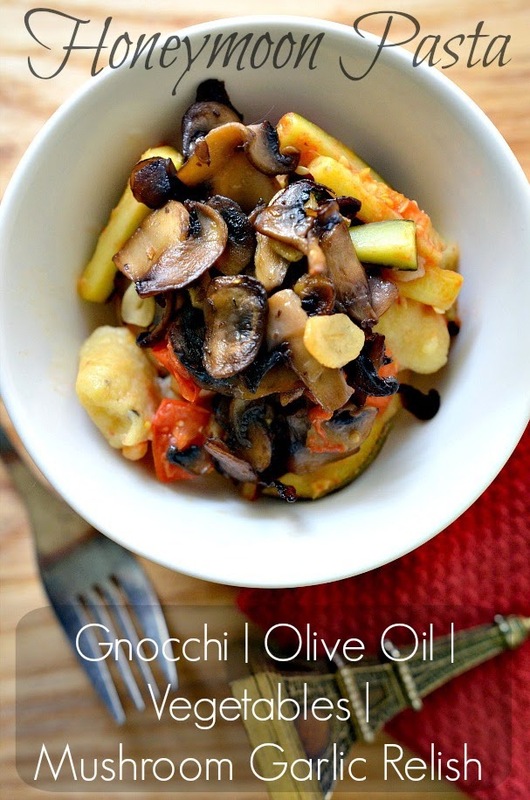 Add the zucchini, and cook for about two minutes before adding the tomatoes. Cook the vegetables until the tomatoes soften and start to loose some of their water. Add the gnocchi and carefully fold into the mixture. Remove from the heat and season with salt to taste. 4. 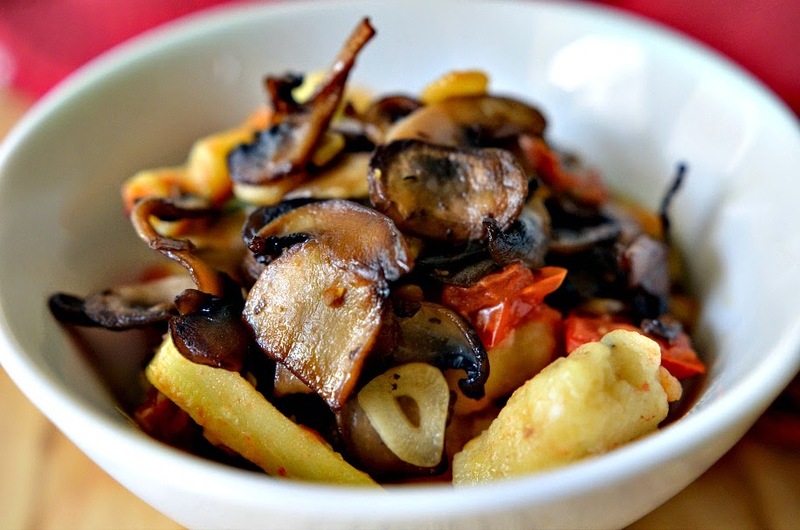 Divide the pasta into two bowls and top each with the mushroom garlic relish. Serve with fresh cracked pepper and a good glass of wine! This post contains Amazon Affiliate links. Purchases from these links could result in a small commission used to support Housevegan.com.